Perhaps you've seen them—those mammoth and intimidating pinwheel type structures that have long thin bodies and propeller like blades that look as if they could literally take you out in one fell swoop. Perhaps you've seen them—those beautiful and sleek, yet elegant, structures with feathered blades that are beautiful instruments representing a symbol of a clean energy future. What I'm talking about here are wind turbines. And for most of us, those structures evoke one of those two extremely different images within us. And in fact, believe it or not, the look of these structures is what is actually the biggest complaint and concern about what could be one of the greatest alternative energy sources to modern America: offshore wind energy. At least that is what Jen Filiault explained to me prior to her keynote presentation in front of a packed audience at the Tom Ridge Environmental Center (TREC). On Wednesday, March 14 at Environment Erie and the Clean Air Council hosted an educational forum about offshore wind in Lake Erie. "The view is very personal. I can look at something and think that it's beautiful while someone else can look at it and think that it's unattractive," said Filiaul, the coordinator for Civil Society Institute's offshore wind program. She is currently focused on an initiative called Citizen Partnerships for Offshore Wind (CPOW), which is a collaboration of organizations working in coastal communities to educate the public about offshore wind energy. And, although this is a fairly new venture in modern America, according to proponents, its benefits far outweigh its detriments. "First, it's clean energy, and our country really needs a more diversified energy portfolio—we rely very heavily on fossil fuels," Filiault said. "Our infrastructure is aged—our transmission lines that we currently get energy through are upwards of 100 years old." In addition, she added that it would spur economic development and help to create thousands of engineering, manufacturing, construction, and maintenance jobs. It will eliminate almost 2,000 tons of carbon emissions annually and alongside other renewable energy sources we look at, it will be able to move us away from our foreign oil dependency and security. Although, serious concerns have been expressed about this power source. "The country has had concerns about the impact to fisheries and migratory birds and also air traffic." Filiault added that many people think that offshore wind will endanger aquatic organisms and destroy their habitats and that the turbines cause massive amounts of bird fatalities. However, most of these have been debunked through an environmental energy report that the Bureau of Ocean Energy Management issued, reporting that these concerns were found negligible and even the 'view' issue was minor. And Lake Erie is a great candidate for this power source. So, how does it work? 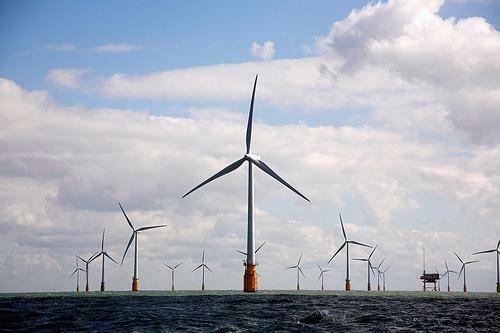 If still waters run deep, then offshore wind turbines wouldn't fit the phrase. Without shallow water (and obviously air movement) these structures wouldn't survive. The air moving over the wind turbine blades creates an aerodynamic lift, causing the blades to rotate. With that, the energy produced is then converted to electricity and sent via underwater cables to power stations on land. Ultimately, a sensor in the turbine ensures that it points the correct direction for optimal energy generation. As for where we all are—to put this in perspective—the world's first offshore turbine was built off of Denmark in 1991. Since then, hundreds more have been built throughout northern Europe. And not shockingly, today, Europe leads the world in this energy production. As for America? Currently no offshore wind farms operate in U.S. waters. Delays for these projects are largely due to a lengthy and complex permitting process, marketing uncertainty, and Congress. Want to know more? There are a variety of resources to find more information about this process, including; the Clean Air Council (cleanair.org), or environmentERIE (environmenterie.org). Do you believe the cosmetic build is truly the biggest issue of all? Do clean energy installations disrupt or degrade the natural beauty they're ultimately designed to preserve?